There's BIG news in the BI world, of the magical sort. Gartner just released their Magic Quadrant for Business Intelligence and Analytics Platforms, which reveals the competitive positions of leaders in the BI arena. 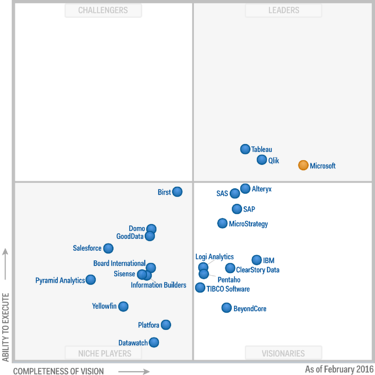 We know the most notable industry players are becoming more distinct – Tableau, Qlik, and Microsoft. Each maintains a solid market position. Here’s what we didn’t expect. Things are shaking up, and fast. The competition is fierce, and industry titans are going all-in to take the lead in what has become a game-changing new resource for businesses. It may have been a surprise, even to Microsoft, that for the first time in nearly a decade, Gartner positioned the Redmond goliath as THE visionary leader in business intelligence. Per Gartner, “Microsoft is positioned in the Leaders quadrant, with strong uptake of the latest release, major product improvements, an increase in sales and market awareness efforts, new leadership and a clearer, more visionary product roadmap.” Then again, maybe Microsoft expected the nod from Gartner, given that Forrester's 2015 Q3 report on the same topic also put Power BI at the head of the pack. There may be no company better equipped to conquer this space than Microsoft. Here’s why . . .
Microsoft is capitalizing on its “second-comer” advantage. Over the past few years, leaders like Tableau and Qlik have demonstrated a veritable tsunami of demand for low-cost, DIY analytics. Seeing that demand, Microsoft drew from its trove of analytics IP (read “Excel and SQL”), to develop Power BI. Their history with data gives Microsoft a unique advantage. Not only do they have the chops to compete in the space, they have already monetized the building blocks of Power BI through the sale of Excel and SQL, making development costs much lower than for those starting from scratch (consider Domo’s recent high-profile fundraising to the tune of $450M). The result? In addition to taking the Gartner lead based on Power BI's functionality, Microsoft has undercut competitors' prices by 90% or more, offering their top-tier, professional subscription for a low $10/seat/mo. Add to that Microsoft’s rebirth as a progressive tech innovator with a newfound love for all things open-source, and Power BI gives the impression of being an agile tech startup. They’ve been releasing new features at an exhausting clip since launching in July of 2015. The latest release is here and, true to form, includes major improvements. Bottom line, we’re witnessing a true market disruption in action, and it comes in the form of an old-school enterprise. By way of illustration, Tableau’s value recently dropped over 40% in less than 48 hours. In response, Tableau’s CEO pointed to several factors, but mentioned just one competitor by name. Guess who. Also of note, Domo, the upstart with the colossal war chest, and Salesforce, a powerhouse in tech, were both a Gartner-mile from the leader’s quadrant. The business intelligence space is not likely a winner-takes-all kind of market. There is surely room for a wide variety of analytical tools, and the industry is poised to grow rapidly. Nonetheless, Microsoft seems determined to take no prisoners. If you have questions about business intelligence, or how visual analytics can accelerate your growth, contact Jon Thompson of Blue Margin, Inc. at jon.thompson@bluemargin.com or at (970) 214-1652. Them's fighting words! This week's beer is in recognition of Power BI, which has become more than just a "minor" threat to fellow Quadrant leaders like Tableau. This brew from Black Bottle Brewery pairs excellently with a Friday afternoon sit-back to review your key metrics. With an IBU of 60, "Just a Minor Threat" is one bitter brew to swallow. Described by Black Bottle as a "gansta" beer, we have no doubt you'll be ready to take on the world (with a frothy mustache) after a pint of this beast. If you're interested, come visit us in Fort Collins, where there are more breweries than one town should be allowed.